2011 4 Comments Written by Nika K.
Hello everyone! Sorry I haven’t been posting for the past few days or weeks since I have school going on and stuff like that. 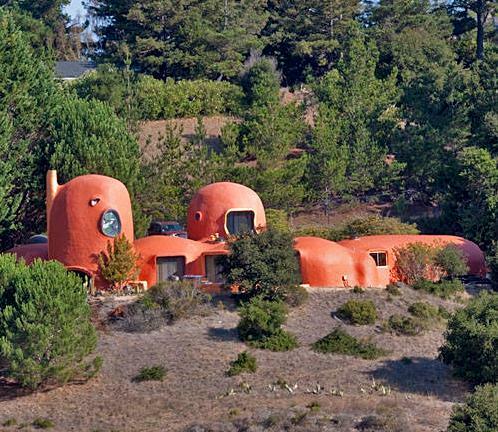 Today, I was on the internet to see what was going on Yahoo and I found this article on a house that looks like the house in the Flinstones and it was in California. When I read the article about this interesting house, they’re saying stuff about and info about the house and “Who owns the Bay Area’s Flintstone house? Not Fred and Wilma.” If you don’t know what the Flintones are, it’s a classic cartoon in I think the 1980s or 1970s. I thought it was kind of funny when it mentioned that the house was called a dome house, a bubble house, and a marshmallow house. It was also pretty amazing that the house was built in the 1970s too. If you want to know what the house looks like, I have a picture of this miraculous house at the bottom of this post. You can also leave a comment by clicking at the bottom of this post where it says “Leave a Comment.” Just a reminder, you can also sign up for updates from my blog by putting your name and e-mail address to the right, and don’t worry it’s free. Photo courtesy of runnersworld.com. Don't you think this house looks like a Flintstone house?! I think it's pretty cool how it really does look like a dome house or a bubble house. Thank you so much for giving everyone an exceptionally splendid opportunity to read from this web site. It is often so lovely and also full of a lot of fun for me personally and my office mates to search your site particularly 3 times in 7 days to learn the new issues you have got. And definitely, I’m just usually impressed concerning the very good concepts you give. Selected 1 tips in this article are in truth the very best we’ve had. It is best to participate in a contest for top-of-the-line blogs on the web. I’ll recommend this website! I love this website too. Such interesting reads. I would love to live in a house like that one.